load, up to 3000 mm/min. This is achieved by using a separate oil circuit, fed by a pump with high volumetric displacement. Contrary to the high speed attachment based on a nitrogen accumulator, here a constant drawing speed behavior is guaranteed over the total displacement of 150 mm. As to the technical design and the options available, including PC control and proportional valve technique, this machines are similar to Models 145. With electro-hydraulic Drive and PLC. 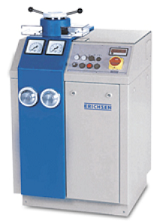 With an extensive tooling and accessory list, the machine performs FLC-Test, Bulge-Test, High Speed Test standardized. 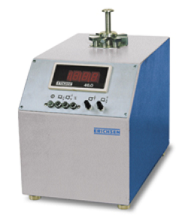 Model 161, is an electrohydraulic testing machine to carry out the hydraulic cupping test on all ferrous and nonferrous metals. Specimens up to a size of 400 x 650 mm can be tested. In addition to the actual hydraulic forming process the design of the machine also allows the use of ball punches (FLC) up to a diameter of 100 to 195 mm. 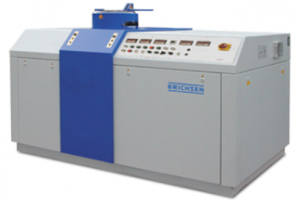 The Models 145-60 and 145-100 belongs to the top-of-the-line models of our sheet metal testing machines. Depending on the demand, there are two versions available: with a drawing force of 600 kN or 1000 kN, including an increased blanking force and blank holder holder force for blank diameters up to 220 mm. The testing machines are equipped with electro-hydraulic drive, fully automatic test sequence and switch-off at specimen failure. 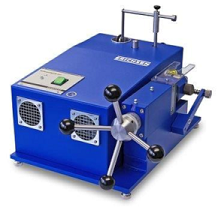 This Sheet Metal Testing Machine is not only ideal for the effortless, quick and accurately all important and known-deep drawing tests for ferrous and non-ferrous metals, it is also designed for a large number of additional technological investigations. Universal Sheet Metal Testing Machine with electrohydraulic drive, fully automatic test sequence and switch off at specimen failure, max. drawing forces200 kN or 400 kN -Model 142-20-BasicandModel142-40-Basic, Model 142-20 and Model 142-40 are available. 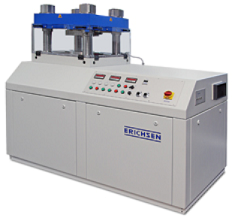 Capable of performing ERICHSEN Cupping Test, ERICHSEN Deep Drawing Cup Test, FLC-Test, Bulge-Test, High Speed Test including an extensive range available on request. With electro-hydraulic drive and fully automatic test sequence. 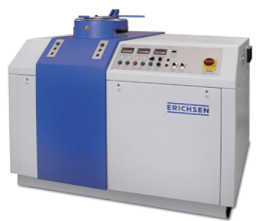 ERICHSEN Cupping Test, Deep Drawing Cup Test, Bore Expanding Test, Data Evalution Software with User Test Software, Data logger for recording the measurements such as drawing and blank holder force and stroke. 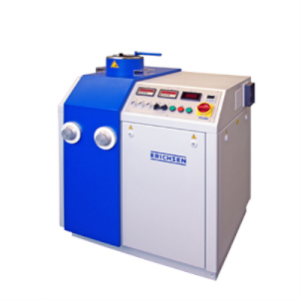 This Sheet Metal Testing Machine is intended for testing materials in the medium thickness range (0.1 to approx. 3.5 mm). It provides rapid an reliable quality monitoring for sheet metal producers and users. 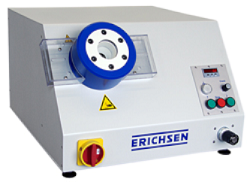 The ERICHSEN Sheet Metal Testing Machine, Model 100, is a bench mounted unit with a cast iron machine body and a cylindrical test head. To conduct the cupping test the sheet metal specimen or foil is entered into an opening through the test head. The screw-in blankholder is set for the sheet thickness using the scale provided. The test head is then tightened manually against a stop on the locating sleeve. This clamps the blank with a force of 10 kN as required by the cupping test standards mentioned above. The clutch pin is pulled outwards from the locating sleeve, the test head is turned clockwise and the cupping process commences. The cupping test value reached is displayed on a digital counter. The forming process and the appearance of the crack can be observed conveniently looking down onto the blank holder.